And I'm struggling to find the time to do it all myself - that's where you come in! I missed Newcastle Playtest again last week (and I'll be in Japan during the next one), and have volunteered to babysit for a friend next weekend which means I'll miss Newcastle Gamers too. I'm going to be restarting playtesting in the office at lunchtime, but by itself that would take ages to get the required testing done. The second edition rules can be played with the first edition cards, so I'm enlisting the help of those of you who have the first edition and fancy helping out to try out the new rules. As mentioned a few weeks ago, the initial starting hands have changed (so the set-up described on the first edition first round card will be wrong) and the Guru rules have changed quite significantly. Single use (same as the first edition) - when targeted by a Overrun you can choose to discard it and block the Overrun or keep it and suffer the Overrun (that's what it says in the rules linked to above). Permanent - Using it doesn't force you to discard it, so it protects you from multiple Overruns for the rest of the game. I feel the single use Army Perimeter is a bit under-powered, the Permanent option might be an improvement (or it might totally break the game!). I'd appreciate any feedback you can provide - in particular, the number of players, won or lost and in which round the win happened if it did. This week I'm off to America for work (I'm writing this at 5am in an airport cafe! ), and I'm intending to spend a decent chunk of the early hours that I will have free due to jet lag laying out the new rules for Zombology v2. I've honed them and now my mate Mal (who has a far deeper grasp of English grammar than I do) is going through them with a fine toothed comb weeding out a few extraneous words and fixing all my errors. In the last week The Daughter and I have spent a lot more time gaming than previously so seeing as I have no progress to report yet, I thought I'd talk about that instead. Since she was three we've played a bunch of the Orchard Toys games with her: Lunchbox Game, The Cupcake Game, The Ladybird Game, Monster Dominoes and more recently Shopping List (which is essentially a rebranded Lunchbox Game). She's enjoyed a few of those (not so much Ladybirds, but Cupcakes was very popular for a while) and a couple of more dexterity based games: Hungry, Hungry Hippos and Elefun. These games have been entertaining enough and she's enjoyed them, but there's very little in the way of decisions to be made (in fact The Cupcake Game is entirely predetermined by the shuffle of the cupcake deck), so there's not been much preparation for real games. I was determined not to force her into playing real (i.e. my) games too early as I didn't want to put her off, but then a few months ago I read a post on BGG about how much fun a four year old son was have with Carcassonne, just because there were choices to be made ('it's like a jigsaw puzzle but I can put the pieces in lots of places'). So I soften my stance a bit. The Daughter and I started playing a cut down version of Carcassonne - no scoring, no farmers, just taking it in turns to place tiles and optionally add meeples in legal places. She really enjoys it ('Carcassonne is my favourite game of all I want to play it every day with you Daddy'), but she still doesn't have the attention span to play through the full set of tiles, so we just play until she gets bored (20-50 tiles in). Because there's no points involved she often helps me ('I'll add this to your city Daddy to make it bigger'), but she knows what she's doing and she's enjoying it, which is the important bit. We've also played a few rounds of Martian Dice together, not tracking the scores between rounds, just taking it in turns playing a round and noting the points we got for that round. She's enjoying that too. This week I bought Animal upon Animal (Tier auf Tier) and The Wife suggested getting Dobble Kids too. She wasn't ready for Tier auf Tier, we started playing a game but she wasn't really engaging with it at all so I've stowed that for later, but she loves Dobble. We've played it loads of times already, and we've only had it a week. I can see that being a huge hit for months to come. With all this real gaming going on she's now showing a lot more interest in my games. Frequently asking questions about the pictures on the boxes racked up in our Games (Dining) Room. Fun times ahead! 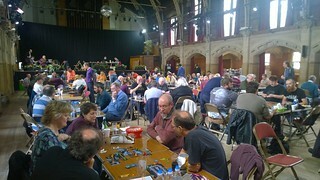 This week I made it to Newcastle Playtest for the first time since April! It was a great evening - good to see the guys and catch up and also check in with their games designs. First we had a couple of games of The Book of the Dead, a fantastic little timed game from Paul Scott. We played it for almost the first time back in April and I loved it, and I was delighted to see that it was just as much fun this time round (by now with much nicer art!). Paul is thinking of Kickstarting it reasonably soon I believe. We ended with Galactic Contractors, one of Dan's that had improved greatly since my last play. In between those we played a couple of games of Zombology, but with some slightly different rules. I'd played it a couple of times recently at work during our lunchtime games club and the rules explanation and then the confusion around hands of different sizes going round made me think I needed to do something about the Guru rules. I had an idea a couple of weeks ago that I tried out one lunchtime and that idea has since evolved in my head into a more streamlined idea. It has the double bonus of simplifying the Guru and failed cards rules and simultaneously getting rid of the uneven hand size too. It worked pretty well, we played a seven player and then an eight player game (I think!) and won both. Everyone thought it was an improvement on the old rules, but we won both games, the first one in round three! The fastest win I'd seen in the previous 100-odd games was round five. So there's a chance it's suddenly much easier. I can't think how that would be true, but I need to play a load more games to get some empirical data. So this week I've been trying to pare the rules down a bit. The rules changes removed quite a lot of 'if this then that otherwise something else' and then I went through trying to cut out all the places where my natural loquacity had made things unnecessarily wordy. I've managed to shave off nearly 300 of 1844 words which, when I lay them out in InDesign, will hopefully free up some space for more diagrams and examples. I'm not expecting to get much done this week - I've a work night out on Tuesday, Games Night on Wednesday, I've got to get stuff ready for a trip to America next week for work and I also want to spend some time with my family before I go. But next week I'm in America all week so I'll probably have the hours of 3am to 7am every day to spend on sorting out the new rules in InDesign. Gotta love jet lag. The good news is that the new rules don't require any new components - they work with the cards as published in the first version. The only slight exception is that the cards dealt in the first round have changed slightly, so the cheat sheet on the first round marker is now out of date. 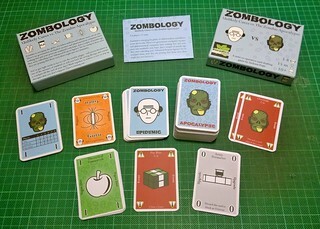 So as I alluded to last week, I'm considering another print run of Zombology. I've played the game a few times recently with people (before telling them I was the designer) and I reckon I could have probably sold a copy there and then if I had one. 'I'm sorry, it's only currently available in the US, shipping to the UK is very expensive and the pound has just collapsed', hasn't sold me many copies! It would be nice to have a few copies around to flog and for Zombology to have a wider audience than the friends, family, playtesters and Reiver Games fans who got one of the thirty copies of the original print run. The rules were printed on paper that was too thick really, and the cards were so thick that once they'd been laminated they didn't quite fit in the box tray. I've got a proof from the printer on slightly thinner card - I've got to cut them out and check that they still feel thick enough for use during the game. I'm considering a slight change to the rules too. There's a situation where a player plays a card that's not valid and if the Guru has been claimed by one of the players the card goes to Guru owner's next hand. This means that one of the hands is now bigger than the rest, which is pretty confusing. Instead, I'm thinking that failed cards always go to the middle of the table, regardless of whether the Guru has been claimed or not. The Guru owner can then, before each round return a Therapy card from their hand to the centre of the table to draw a Therapy card that is the same suit as one of their Gurus from the centre of the table. That way the hands all stay the same size. The art is pretty basic, because my skills aren't great in that area. However, it's a similar sort of game to 6 Nimmt! which also has basic art, so I'm not considering overhauling it. However, that being said, there's room for improvement, so I'd like to tweak it. There's a few fixes I made for the Drive Thru Cards version that would need applying to the hand made one, mostly around making text more legible, plus the Army Perimeter is pretty bland, so I've some ideas to improve that. Last week I got some proofs from the printer for the thinner cards and got information from BGG about advertising costs. I also asked a poll on BGG to see if there's any interest in hand-made games on KickStarter. This week I have four hours on trains going to and from my biannual hospital visit for my clinical trial, so I might start doing some of the art improvements on the off chance this goes somewhere. I joined BGG back in February 2006, when I was considering publishing Border Reivers. I finally got around to publishing Border Reivers in July that year, and started recording the games I played on BGG in August that year. In fact, Friday was the tenth anniversary of my first recorded game on BGG (it was one of five plays of Border Reivers that day at The Cast Are Dice in Stoke on Trent, the first convention I attended as a publisher). That's an average of 400 games a year or over one game a day for ten years! In fact, it's actually more than that, seeing as I didn't record plays of prototypes during my Reiver Games days and I only started recording mobile plays with humans a couple of years ago. Clearly board gaming is a huge part of my life. There are six games I've recorded at least 100 plays of: unpublished prototypes, Carcassonne, Race for the Galaxy, 7 Wonders, Magic: The Gathering and It's Alive! and to be honest the numbers for Magic, unpublished prototypes and to a lesser degree Carcassonne are actually much higher than that, as I played them a lot before starting to record games. I've played over 500 different games during that period. Here's to loads more gaming in the future! In other news, I've been recently frustrated that Zombology is only available really in the US and Canada at the moment through Drive Thru Cards. There have been a couple of occasions when I could probably have sold a copy if I had one on me, and saying 'you can get it in the US for $12 plus $16 shipping' is not going to lead to any widespread adoption. It turns out I'm still rubbish at marketing though, so if I was got to do a reprint I'd need to seriously up my game at promotion, and maybe go down the KickStarter route, despite my previous KickStarter reticence. It's been a good week. Monday and Tuesday I had the house to myself in the evening while The Wife was in Germany, so I spent the time getting a decent chunk of functionality into German language phone app. Wednesday I managed another Games Night (work commitments are cancelling a disturbing proportion of them at the moment). We played Lost Cities, Alea Iacta Est (knocking it off my not yet played this year list), Pandemic: The Cure (same again, plus we played it twice, so two more plays towards ten plays) and then a couple of games of Zombology. We'd also manged my first lunchtime games club in ages that day too - Gav beat me twice at Taluva. Man, I'm so glad I bought that! We've been playing it loads. Then finally on Saturday I made it to Newcastle Gamers too. Newcastle Gamers is on twice a month. We're halfway through the year, so there's been at least (they hold a few special extra sessions every now and again) twelve sessions in 2016. And this was my first one. First! Turns out this new job is keeping me pretty busy. Thankfully I had a great evening. I got there about quarter to eight, and after waiting for five or ten minutes I joined Ruth, Tom and Sarah for a game of Beyond Baker Street. It had a lot of similarities to Hanabi (you play with face-out cards in your hand and have to build sets playing blind from your hand). Our four player game seemed extremely hard and Tom and Sarah who had played it a lot since being taught it by the designers at the UK Games Expo said it was easy with two, but tricky with three. After that, they looked at my pile of games (Endeavor, Homesteaders, K2, Kodama and Zombology) and chose Zombology. 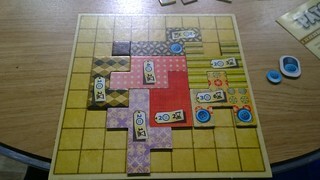 We played it a couple of times and again, I didn't tell them I was the designer until we had finished. They seemed to enjoy it, and asked about where to get it, but of course the only option at the moment is the very expensive shipping from Drive Thru Cards. We rounded the night out with a game of Kodama, another one on my ten plays list (only one game left!). All in all this week, I managed to play two new to me games (Sushi Go! and Beyond Baker Street), three games towards my ten plays list (Kodama and two of Pandemic: The Cure) and two off my not yet played this year list (Pandemic: The Cure and Alea Iacta Est). Busy week! At the halfway point of the year, I've managed to played nineteen games for the first time this year, that's nineteen towards my goal of 24 - it's looking very achievable! After my full-on trip to the States I returned home to a very busy week at work, with loads of people from America and Manchester (including my boss) over for a meeting. To make things more exciting, I caught a filthy cold on the plane home so for most of the week I felt rough as a dog too. By judiciously avoiding alcohol on a work night out on Tuesday (I also left at 7:30! ), I managed to mostly get over it by Thursday thankfully. My only real gaming this week was the first Games Night in three weeks on Wednesday when we managed to tick Agricola off my 'haven't yet played this year' list and another Colt Express play towards my ten plays list. It was a fairly quite one - just Ian, Mike and I which meant we could get a longer game in too. Yesterday The Wife swanned off to Germany for a couple of days for a work conference, so until late Tuesday evening I'm solo Parent-In-Charge of The Daughter. I'm using the evenings after The Daughter goes to sleep to do a bit more work on my German language app (taking shape nicely!) and finally making the next version of Dragon Dance. Last time I played it with Paul (back in 1870-something I think) he had a great idea about replacing the short/long range indicator card with a card that tries to convey a sense of space. I'm going to knock something up tonight and will see if I can get it tested in the office this week. Next week I'm in Romania for most of the week so, if it works, I'll have some time to knock up a proper version of it in InDesign during my mornings/evenings. Of course Romania means no Games Night or lunchtime gaming club again. I need to spend some time in the country! The week after Romania is Newcastle Playtest, and seeing as I've missed the last two (holiday in Portugal and conference in San Antonio), I'm really keen to make it to this one, especially if I've got a new version of Dragon Dance for Paul to try! 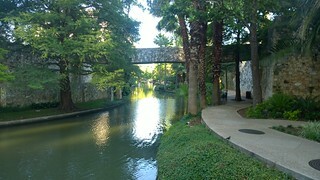 So last week I got one evening off from work in my week long trip to San Antonio in Texas and rather than wander the hospitality suites at the convention hoovering up free beer and food I chose instead to get a cab out to Dragon's Lair and get some gaming in. I'd asked on BGG beforehand and a guy called Sean had told me about it and even offered me a lift back into town afterwards if he was around. If he was around I didn't see him unfortunately, but I still had a great night. On arrival I wandered round the store briefly and had a look at their collection of games (pretty good, but not as extensive as The Source in Minneapolis a few years ago). Then I went into the gaming room and met Chris. He was waiting for the Netrunner crowd to turn up so we had a quick game of Kodama (its nice small box is very portable!) and then they arrived and I was invited to join a game of the Legendary Deck Building Game with Al, Jimmy and Chante. I think we got a couple of rules wrong (none of us new the game well enough to pick up and explain so we were learning from the rules - which is often tricky), but it was fun nevertheless. After that Michael joined us and we had a game of Dead of Winter, which was new to all of us except Michael. It turned out that Michael was a traitor, so against four newbies he had fairly easily run of it and the rest of us were overwhelmed after an hour and a half or so. After that it was getting late so Chante and Al headed off and Michael, Jimmy and I had three games of Zombology. It was an easy sell after Dead of Winter - another zombie-themed semi-coop but one that played in ten minutes! I had introduced myself as Jack and didn't call out the fact that I had designed the game, so as far as they were concerned we were just playing a game I'd brought along, rather than one I was pushing as the designer. We ended up playing three games: I won one on my own, we all died in the second and in the third I think we all won. The guys really enjoyed it and it wasn't until we were in the car on the way back to my hotel (Michael had kindly offered me a lift) that I told him I'd designed the game. I'm still not sure why I kept it to myself but it worked out OK! We ended the night with a quick pint in the hotel bar which was rammed with people from the convention. All in all a great night: another play of Kodama towards my ten plays, a new to me game towards my 24 new to me games this year goal and some Zombology fans. 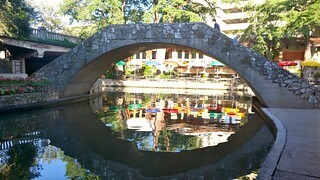 As I mentioned last week, I'm in San Antonio, Texas this week for work. It's a very busy week but I've managed to get tonight off so that I can go to the San Antonio Board Gamers meetup at Dragon's Lair. I've brought Zombology, Dragon Dance (which needs an overhaul) and Kodama with me, hopefully I'll get to try some new stuff too. Last week I was away for a mid-week trip to Derbyshire for my friend Tim's secret birthday party. It was Monday to Friday, but we had to leave on Thursday as I was flying from Newcastle first thing on Friday morning. I took a decent stack of games: Zombology, 6 Nimmt!, Kodama, Incan Gold, Ca$h 'n Gun$, King of Tokyo, Colt Express and Firefly. Tim had brought a load of games too and Simon and Duncan had also brought a few. I managed to play everything I brought except 6 Nimmt! but managed to miss every game of something someone else brought due to either looking after The Daughter, cooking a meal or having gone to bed early to make up for a game of Firefly the night before which had finished just after 2am. Zombology was well received after the first couple of games when people were still trying to work out what was going on - it seems there's a fairly steep learning curve for new players. We also saw a game where Zombyism was cured but none of the players won, which was a first I believe. Two plays of Ca$h 'n Gun$ took that off my ten plays list and the plays of Kodama and Colt Express also moved them nearer to escaping from the ten plays list. I've now got 12 games left on the list, one of which is definitely going, three (Koi Pond, Libertalia and Pandemic: The Cure) are at risk and might well go too and the others I expect to have cleared off the list by the end of the year. My unplayed so far this year list however still has 26 games on it, including many previous staples such as Die Speicherstadt, Puerto Rico, Thunderstone and Agricola. These lists are just for interest this year, instead of part of my goals. The only gaming goal I have is to play 24 new to me games this year. At 16 by early June I'm in good shape for that, let's see if I can add any tonight! 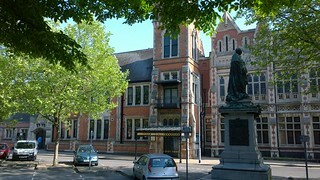 The week was largely mobile development progress. I've been focussing on my German language app for yet another week, adding more content, but also adding local notifications, so you get a toast notification when you get something to practice and the shell tile updates with the number of words you need to practice every half hour. It's amazing how much more professional that makes it feel (the first German language app I got on my phone didn't do that - you had to keep opening the app to check). It also makes it much more usable, for that very reason - now I only start the app when practice tests are ready or to learn something new. I set myself a goal to release the app this year, and that is now beginning to look achievable. In other news I started a lunchtime games club. Mal, Gav and I played Taluva (fast becoming one of my favorite games - also one of Gav's). We're going to play it again next week. In yet further news, at Games Night we only managed one game: Battlestar Galactica, which I'd not played for a couple of years. It was a weird game - we were all humans until distance six, and then the two cylons (including myself) revealed quickly to try to scupper things before they reached Kobol. We had almost no cylon fleet action until the last couple of jumps and the humans managed a fairly easy win (though we did get them down to 2 fuel and 1 population). I'd like to play again for a more normal, paranoid experience! This week hasn't been as epic as last week, but I've nevertheless managed to make solid progress on a couple of things. It was a busy week at work (though all in the office - no travel!) with visitors from America and Manchester up along with my boss for several days and a work night out (rare enough for me) on Tuesday. Once that was out of the way we had another good Games Night on Wednesday (more Taluva and Colt Express :-) ) and then I fit in some more development in the evenings towards the end of the week. One of the things I miss about being a developer in my day job is the feeling of accomplishment you get when you write some code, compile it and it works. You've clearly achieved something. These days my day job involves meetings and sending and responding to emails - it's harder to spot when you've done good work. The last couple of weeks I've made really good progress on my learning German app, and I can tell that, because I can use it to strength my German - the proof is in the pudding. I'm now in a position (after a whole week of faffing on refactoring things) that I can quite quickly add a lot more vocabulary, which is what it needs to be useful. To me and others. There's a bunch more stuff it needs to be shippable, but it's not a million miles off, so that's a goal for the year in my sights. I want to use it to strengthen my skills in a way that Duolingo doesn't allow me to, and the other apps I've tried don't do either. I've started learning Portuguese with Duolingo too, and already I'm wanting to get a Portuguese version of my app together too. So I must be doing something right (if only for myself!). The other thing that has gone well this week was more Dragon Dance playtesting. I got a chance to try the new version out with Amaury, who really wasn't very keen on the previous version. He reckoned the new version was 'way, way better for the dragon player' and we even saw a win for the knight - the first in ages. I need to tweak a couple of minor things and then I'll be looking for more playtesters and a wider range of feedback. Shout if you're interested. I've spent a whole week in Newcastle! That doesn't sound that impressive, seeing as it's where I live and work, but in the preceding two weeks I spent five and a half days in America and two days in Manchester. With a whole week of evenings at home I've been amazingly productive, with Dragon Dance, with Zombology and also with my German language Windows Phone app. Broad-based productivity! Last weekend I picked up my German language app again for the first time in at least eight months. It was the first time I'd written any code in eight months! My new role at work doesn't involve any coding and I'd been so focussed on Zombology (and latterly Dragon Dance) that I'd not done any at home either. After last weekend's long night of coding on Saturday while The Wife was out, I've been working all week re-structuring the code extensively to make it easier to add extra vocabulary to the app. I want it to do two things which I struggle with in Duolingo (the app I've been using to extend my German skills): limited vocabulary, and a lack of tabulated data. I find it easiest to learn verb conjugations or adjective declensions from a table where I can see at a glance how things are structured, but in Duolingo you come across things fairly haphazardly and never get to see the table (don't get me wrong, I think Duolingo is great - I use it daily for strengthening my German and more recently learning Portuguese ahead of a holiday). It's coming along nicely, and it feels great to be coding again - it's been a hobby of mine since I was ten and my day job for the vast majority of the last eighteen years. If that wasn't enough, I also had my first Games Night in three weeks (the aforementioned travel nixing the previous two) which was also epic. There were only three of us, but we managed six games: three of Hive with Mike before Gav arrived (ticking Hive off my not yet played this year list); two of Taluva (christening my new copy, ticking two plays off my not yet played ten times list and Taluva off my not yet played this year list) and then one of Colt Express (christening my new copy and ticking one play off my not yet played ten times list). I'd not played Taluva in about four years, but it was just as awesome as I remember it being, and Mike and Gav seemed to really enjoy it too (we almost played three games back to back). After Games Night, I printed out a copy of the new version of Dragon Dance I came up with last week and then Gav and I tried it out on Friday lunchtime. Gav seemed to enjoy it and I think it's an improvement on the previous version - I need to run it by Amaury now to see if it addresses his problems with the previous version. Finally, to round out the week in style, I got the Print on Demand proof of Zombology from Drive Thru Cards and got to proof it on Friday night (I'm a wild man of Rock - that's how we wild men of Rock spend our Friday nights). There was one glaring error (I'd somehow managed to delete one of the card backs) and a couple of minor ones (the front and back cards that are intended to form the equivalent of a box lid and box tray design were facing the wrong way). So I've fixed those and uploaded the corrected art. After talking to Brian I'd already uploaded new art with the 100% Key black replaced with Rich Black, but the proof had been done with 100% Key and it looked fine and there were a couple of registration issues on some cards, which would make rich black look really dodgy, so I unwound that change too. If only every week was that productive! The game I'm currently focusing on, Dragon Dance, is a two-player game themed around the epic struggle between St. George and the Dragon. I want it to be a game of simultaneous action and bluff that recreates the feeling I had when sparring during my Tae Kwon Do days - watching your opponent careful for the minute tells that telegraph his next move so you can counter-attack, block or move out of the way appropriately. Clearly a game which features a human knight and a dragon also needs to mirror the asymmetry of that match up - the knight needs to feel in mortal danger throughout as he takes on a vastly more powerful foe. At the same time the dragon needs to feel frustrated as the nimble knight dances around his vast unwieldy bulk delivering small wounds which slow add up over time to a threat. So the game needs to be, and feel, different to each player. Initially the asymmetry was fairly superficial. The knight had far fewer hit points than the dragon, and the dragon was limited in his actions by a smaller pool of dice that were required to perform an action, requiring the dragon to pause more frequently to recuperate and regain his dice. Some of the first feedback I got back during NaGa DeMon 2014 was that the game felt too samey, so I tried to change the actions available to each player to make the dragon feel more powerful but clumsier - which I chose to do by making his actions work well with good dice and do nothing with poor dice. Sadly this just broke the bluffing aspect for the dragon player, as his choice of dice (the possible bluff) was now: He's doing x or wasting a turn - so clearly, he was doing x. When I came back to Dragon Dance at the beginning of this year, turning it on its head improved some things (the theme feels tighter now, as does the reading the tells bit) but broke others - the dragon's options were too few and too samey. It felt much less interesting as the dragon. While somehow making it not so powerful that it always wins effortlessly in the first couple of turns! I had hoped to do something in the early mornings while away in America, but by that point inspiration had yet to strike so I had to settle for just finishing the Print on Demand version of Zombology and reading books. Inspiration finally struck at the beginning of last week, which meant I was well placed to work on it while I was away in Manchester at the end of last week (I missed Newcastle Playtest last week because after five and a half days away in America I had another couple of days away the week after - I chose to spend some time with my family in between instead). I want the dragon to feel clumsy and slow, very powerful, very dangerous, but clumsy and slow. Fewer action cubes (the dice equivalents in the new version) is part of that, but the new cards with three possible actions on them (an attack, a defence and an action) mean that the dragon feels very similar to the knight, and since the dragon's cards were all very similar, the choice of card wasn't very interesting either. So I've decided to further rein in the dragon by reducing his options. Now each of his cards contain two out of the three options: attack, defend and action. As a result, I hope the choice of card will be more interesting (Attack/Defend? Attack/Action? or Defend/Action?) but the dragon will feel more restrained and hence clumsier, which will also give the knight a little more information, hopefully making the game less heavily weighted towards the dragon (I want the dragon to win a bit more than the knight, but not 100% of the time like it is at the moment!). In other news, during a meeting with my boss's boss on Friday he ordered a copy of Zombology! There's only one of the limited edition left now, almost done! I started working for my current employer back in 2001, when it was a smallish independent company. I was working for them when I started designing Border Reivers and several of my friends and colleagues were among the Border Reivers playtesters. In 2005 I left the company and it was during my years in the wilderness that I finished Border Reivers, set up Reiver Games, self-published Border Reivers, went into full-time publishing and eventually gave it all up for a salary. After a couple of years out of software development I came back for a summer as a contractor while winding down Reiver Games and eventually I rejoined as a full-time member of staff in 2011. Since then I've been running a weekly Games Night (known as Wizard Night in the office - one of my colleagues thinks we all dress up and play D&D), largely populated with friends who are current or former colleagues from my current employer. In August 2012, my employer was bought by a large American corporation, and I've spent the last week in Milford, MA visiting the corporate head office for a meeting. As part of that meeting we had a networking exercise where the 65 attendees had to provide a unique fact about themselves and then you were tasked with finding out which unique fact belonged to each of your 64 colleagues. I chose 'I have designed three published board games' as mine, since most of my corporate colleagues didn't know about my inner geek - it doesn't come up in conversation much. Ok, so that's a slight stretch, the three games were all self-published, and Border Reivers and Zombology had a very small print run. But it's technically true. As a result of discussions around my games publishing past (and current! ), I found three gamers out of the group (including my boss's boss! ), got invited to go and play Netrunner in Boston one evening (which unfortunately I had to miss due to a prior dinner engagement), played Netrunner in the hotel bar with a colleague and sold and delivered my first copy of Zombology to the US to another colleague. Off the back of this I've been invited to Tabletop Manchester if I'm ever staying the night there on a Monday night by my Netrunning colleague and have been approached by another colleague about an educational board game design project he's been considering for a number of years! Finally, in the taxi back to the airport from the office I got chatting to my driver and it turned out he was a keen gamer and game artist (with 33 games listed on BGG) who had been to Essen a couple of times and GenCon too. I also got to spend the hours of 3:30-6:30am most mornings working on the Print on Demand version of Zombology and getting the art uploaded and a proof ordered. For a business trip it was surprisingly game heavy! When this post goes live on Monday morning I'll be en route to Milford, MA for work. Last week was pretty hectic with preparation for my trip, so I didn't make a huge amount of progress on anything, but I did manage to get Adobe Creative Cloud installed on my work laptop, so I can work on the Print on Demand version of Zombology during the very early mornings in the States when I'm likely to be awake with nothing to do. I might also get a chance to tweak Dragon Dance too, once I've had a chance to think how I'd like the tweaked version to look. The best thing about the Creative Cloud install was that no sooner than the apps were installed all my files appeared on my machine too. The files I'd created on my laptop were backed up to the cloud and automatically copied down with the new install - mint! The print on demand version is mostly done - I've done the game cards and laid them out in a print document - now I've just got to do front and back 'packaging' cards (the deck of cards comes in a clear deck box, so the first and last card are effectively the box lid and box back). I'll put box art-y things on those, but then I've got the reverse of those cards free for extra information. 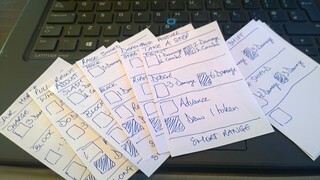 I'm also going to do a re-layout of the rules so that they fold nicely to fit within the deck box. Once that's done, the last stage is to order a copy to ensure I've got everything right and then it can go live. I've mostly been focussed on Dragon Dance again this week. After a busy January finishing off the physical copies of Zombology it felt good to crack on with Dragon again. I made a second version which replaced last week's hand-scribbled version on the train on Tuesday on my way down to Sheffield for my now six-monthly hospital visit. It was pretty much the same as the hand-scribbled version, with a couple of tweaks based on the games I had at Newcastle Playtest and then again with Gav in the office. On Thursday I got to try out the new version with Amaury, who had played the 2014 version a couple of weeks ago. Unlike Gav (who preferred the new version), Amaury preferred the old one, he found the new one less strategic. In a good discussion after our three games we came up with some ideas, in particular to give the dragon more exciting options (the dragon cards are the moment are all pretty similar). Interestingly, giving the dragon more exciting options was some of the feedback I received back in November 2014 when I was making the first few versions during NaGa DeMon. Clearly, I need to pay more attention to the feedback I'm getting. Later in the week I had an evening to myself while The Wife was out and I started getting to grips with some artwork for the new version. With separate cards now for long and short range I can make the card backs a bit more informative, so I want the cards to represent what your opponent sees when you initially play them face down. 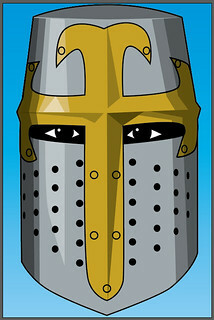 So the short range cards are a knight's helm (see below) with the eyes peering out, and the dragon's eye up close, while the long range cards are a full view of the knight and the dragon. Obviously this is a very early work in progress version, but I'd like any feedback you have. In other news, I'll be in Milford, Massachussetts all of next week for work. I've set myself a goal of getting the Print on Demand version of Zombology finished in February. Thanks to being up around 6am (or slightly before) most days in the UK, I'm likely to wake very early while I'm in the US, so I reckon I can finish off the graphic design on the computer in my hotel room between the hours of 3/4 and 7am every day, so hopefully that might be a second goal successfully ticked off this year! I've not got any travel this week, so I can try to either do another version of Dragon or get a headstart on the Print on Demand Zombology one night this week. This week I made it along to Newcastle Playtest for the second month on the trot (pretty good effort - since my new job started there's been a lot more travel and hence fewer nights out). Of course, it wasn't straightforward, as I was in Manchester for work that day, so rather than heading over from work at 6:30, I turned up at 7:45 from the station. Several of our regulars were even more inconvenienced by travel, so it was going to be a fairly quiet night until a couple of new people (Hello Michelle! Hello Bart!) turned up - in the end there were five of us with Paul and Alex. Alex had brought his two player game: Swag, Blag and Goons, Paul had brought his two player game: Kick, Punch, Stomp! and I'd brought two two-player games: a new version of Dragon Dance and Border Reivers Second Edition. We ended up splitting up and playing a couple of side-by-side two player games, but not before playing three games of the copy of Zombology I'd delivered to Paul at the start of the night. Both the new people seemed to like it, which was encouraging. We played a couple of games that night, one with Paul and one with Bart and they flushed out some problems, and also some weaknesses, Bart had not played the previously version, and it had been a couple of years since Paul had last played so neither of them could compare it to the previous version (which I'd foolishly left in my desk and then failed to collect in time for the session due to delayed trains). Initial feedback was that it was interesting and worth pursuing if clearly in early development. On Friday lunchtime I also got to try it out with Gav, immediately after a game of the previous version so he had a useful comparison. Gav preferred it to the previous version, which means I'm probably heading in the right direction (at least for Gav!). The new version is still a Good Little Game, i.e 18 cards and things you can expect to find around the house, but each card now does one to six things depending on the tokens available to you. The bluffing still works (Gav caught me a few times on the hop) and he really liked that each card is now named with a tell that you're reading and trying to interpret. I need to make another version now (this one has some inevitable flaws) and then start gathering more data. I want it to be slightly easier for the dragon, but at the moment it's very easy for the dragon - I'll need to tweak things to try to balance that out too. Back when I ran Reiver Games I made four games. The first Border Reivers was a hand-made limited edition, and I did almost everything myself, including the art (except the box cover, that was an original painting by my dad, a retired art teacher and artist). It was ... basic. Very basic. But back in the days when a self-published game was a fairly novel item, it was enough to get me by, and didn't put off the 100 customers to whom I sold a copy of Border Reivers too much. For my second game, I got a friend who was a computer games artist to do some really cool Frankenstein-themed art, and because he was a friend, I got it dirt cheap. It still added a £1 per copy to the total cost though, a not insignificant amount. While I loved the art on the It's Alive! components, I was less enamoured of the box art, and it received some criticism from punters, so when it came to making a second print run, this time aimed at shops at distributors, I asked him to do another box. Sadly, I don't think that box was any better. My third game was Carpe Astra, and again I got the friend to do the art, again at mate's rates (though with a print run of 2,000 I could afford to pay a bit more this time, despite the fact I was aiming to sell to distributors and hence was pitching at 40% of retail for a manufacturing and art cost. Again I was a bit mixed on the art, I loved bits of it, but I think the box art could have been better, especially with the target market in mind. For my final Reiver game I splashed out and hired bona-fide board game artist Harald Lieske to do the art. Harald's done the art for several games I own (Vikings, the Spiecherstadt, Puerto Rico) and several other famous ones (Dominion, The Settlers of Catan), so clearly a big name with loads of board game experience. He knows what looks good on a box and how to do all the art ready for printing. I was doing a relatively small print run (3,000 copies), so my budget was limited (but many times what I'd paid for the previous games!). We eventually reached an agreement where he'd meet my budget in return for simpler art than he was originally planning. I was delighted with how Sumeria turned out, it's still my favourite art associated with one of my games by quite some distance. What brings this to mind is two things: Zombology and Kickstarter. With Zombology (which I've finally finished - one of my goals for the year ticked off already! ), I went back to my roots and made a short hand-made print-run doing everything myself including the art and cutting out boxes and all the cards by hand. Actually, that's not strictly true, I took some of the icons from Game-icons.net, either as was, or slightly tweaked. But the point still stands, the art is mostly mine and pretty basic, this is not a beautiful game. While I hope it's not so distracting as to put off the 28 customers I need to cover my costs, it's not winning any art awards. In these days of Kickstarter, games need to be beautiful to attract punters, and despite the vast wealth of games on Kickstarter, generally the art is of a very high quality - it's almost expected. My friend Tim's game Toast is a great example of that. To set up a games company these days you need to either be a great artist (Daniel Solis, I'm looking at you), have a wealthy good friend who's an artist (do they exist?) or to fold a large art cost into the manufacturing cost of the game. I can't help but think that life would have been easier as Reiver Games or Zombology would have sold faster if I was a great artist or if I'd set up a partnership with a wealthy, games-loving artistic genius. As I continue with my own game designing (and conceivably self-publishing), I want to work on and improve my artistic skills. Practice might not make perfect, but it's definitely going to improve my skills, which can't hurt in making my games easier to sell. In other news, January was a staggeringly good month, 59 games played, Zombology construction finished and a weekend in Coventry with Tim and a weekend in York with Paul. I wish February would be as great, but a work trip to Boston, MA is going to get in the way of things, so I'm not expecting much. At least I'm hoping to finish off the print on demand version of Zombology as I planned in my 2016 goals.